DONETSK, Ukraine -- Train tickets are sold out in all directions. Shipping companies are booked weeks in advance. For rent and for sale signs are plastered on stores and apartments like political posters during campaign season. Rebels who control this area of eastern Ukraine announced this week that they would soon evacuate residents from parts of Donetsk ahead of a possible showdown with the Ukrainian military. But by Friday, many residents had already left, turning what had been a city of one million into a ghostly shell. Streets are empty and parking lots wide open. Plywood is nailed up over store windows, as if in anticipation of a hurricane. Most of the city’s car dealerships have moved the merchandise to a safer place. Shortly after 5 p.m., the last Honda motorcycle, sleek and powder blue, was rolled out of Arda-Moto, a dealership downtown. “It’s like the city is waiting for something,” said a 35-year-old lottery ticket seller, who said attendance at her church on Sunday had dropped by three-quarters. The exodus was taking place as the Ukrainian military suffered its worst day of casualties in weeks. Nineteen soldiers and four border guards were killed when rebels fired what the Ukrainian military said were Grad rockets from a Russian-made truck-mounted artillery system into an army camp near the village of Rovenky. The attack, which began about 4:30 a.m., took place at two points near the border with Russia and lasted for an hour. A photograph of its aftermath showed a scorched field littered with twisted metal and burned military vehicles. “A calamity has occurred,” said Vladislav Seleznyov, a Ukrainian military spokesman, adding that 93 were injured. The attack was the biggest since rebels shot down a Ukrainian military plane some weeks back, killing more than 40 soldiers and officers. It came as Ukraine was pressing its military campaign against a pro-Russian insurgency that inflamed this country’s southeast this spring. 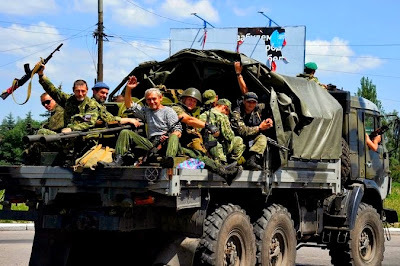 The military drove the rebels from their main stronghold last week, and several thousand fighters have now descended on Donetsk, the regional capital. The stream of residents from Donetsk began as a trickle, but has increased in recent weeks as the fighting has drawn closer. Destination often depends on political persuasion. Those sympathetic with the rebels tend to head to Russia. But large numbers were leaving for Kiev and other cities in southeast Ukraine. Maxim Lyakhov, 26, a businessman who transports goods across Ukraine, drove back from Kiev on Wednesday. He said the road was full of cars with Donetsk and Luhansk license plates. He estimated that half the city’s residents were gone, including most of those with money. “Look around, where are the Lexuses, Mercedeses and BMWs?” Mr. Lyakhov said. But the train station still bustled. On Friday, families were dragging large bags onto platforms. People stood in line for hours for tickets that were sold out well into next week, while their children, bored and sweaty, played nearby. “I can’t keep up,” said the train station’s main telephone information clerk, a woman with blond hair, who said some callers were crying. Like the woman selling lottery tickets, she insisted on anonymity, reflecting the pervading mood of distrust and fear. “You think they are going on vacation to their grandparents’? No. The city has lost several basic functions. The traffic police quit en masse after four police officers were shot at point-blank range last week. And armed men robbed the region’s largest bank last week, PrivatBank, carrying out bags of cash worth more than a million dollars. Now its branches are closed, making it harder for the elderly to get their monthly pension payments. And as car theft has soared, demand has spiked for Soviet-era Zhigulis, small, fumy Russian cars that are so awful even the thieves don’t want them. Some people had to travel through war zones. Alexander Konoplyov said he drove from a village near Horlivka, where battles have been particularly intense, to bring his family to Donetsk to put them on a bus to Russia. His tire went flat on the way after a bullet lying on the road pierced the rubber. “I’m sending them to where there’s no shooting,” said Mr. Konoplyov, wrestling with his family’s six large suitcases. A girl from their village had been killed last week when a stray bullet sliced through her family’s car as they fled the area. Fighting continued around the edges of the city, including at the airport, the scene of the first large battle here. Stratonavtiv Street still bore signs of Thursday’s fighting. A semi stood driverless, its tires blown out and its trailer leaning to one side. Small branches torn off trees lay across the road. The area was still and emptied of people. A drunken man walking along the sidewalk broke the silence. He introduced himself as Igor. “I don’t want to live here anymore,” he said, lighting a broken cigarette. When asked where he was headed, he began to cry.